Seven Against Thebes champions all the components of a solid rock album in the 13-track Art of Deception. Forged from the Emerald City herself, this Seattle-based four-piece hard rock bandcharts a course of cold, dystopian-like riffs, rumbles and ricochets. I quickly surrendered to the harnessed anger and perpetual percussions as they colluded with deep vocals. 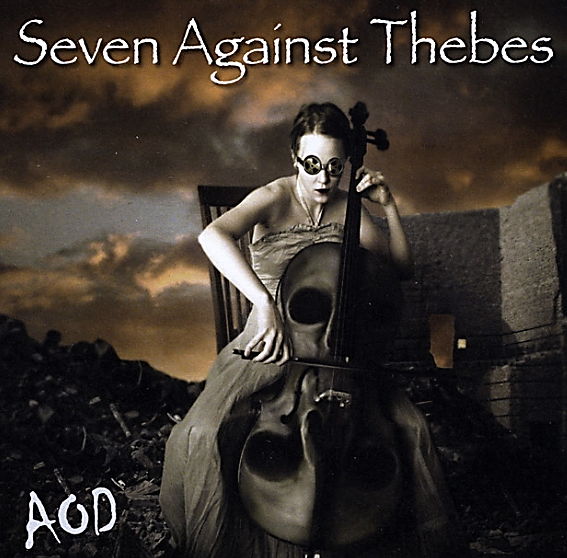 Seven Against Thebes – an analogy for good versus evil – goes to great guitar heroics in this hornet’s nest of spitfire sounds. Seven Against Thebes is comprised of Mr. Black (bass), Bruce Burgess (drums), Rusty Hoyle (vocals) and Cyrus Rhodes on guitar. Collectively their explosive efforts are only outdone by the interesting lyrical content. They also know how to juxtapose the heavier riffs and exciting music beds with softer and even instrumental tracks. The 13-track ride is a whale of a time, and the respite in between is welcomed. Much of the songs, like “Judas Kiss” have an escapism feeling. As a listener, I found my mind racing and throwing fists full of sadness, euphoria and even confusion. It was never scary to find that part of me, but invigorating and freeing. Seven Against Thebes always seems to reign me back in, though. I think lyrically, songs like “Ashes 2 Ashes”and “Slave 2 The Needle” are works of art that capture ranges of very relatable emotions. The chorus’ follow you and the guitar riffs run circles in your mind.It’s an instrumental, but the haunting “8 Husbands of Cleopatra” has devilish details and fantastic reverb. The repetitive riff is a stunner. The title track is a fast moving, grungy hit. Hoyle’s vocals will remind some o fMaynard James Keenan’s delivery, but something more stoic, yet personable is happening with Hoyle in this track. It’s like he’s smirking at us while he’s singing, and the drum fills are in on the joke. It’s a killer track. Some of the other standout tracks are “Collision Course” and the Arab-guitar pattern with click-percussion-like “Fly Paper.” You feel something different with each track and you invite that confidence this band invokes into your experience. Fans of Tool, Stone Temple Pilots, A Perfect Circle, Alice In Chains and Five Finger Death Punch will find something they like on Art of Deception. Seven Against Thebes have won this battle.